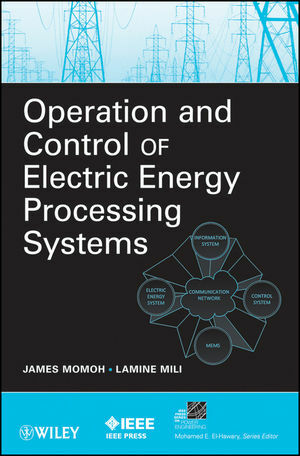 The purpose of this book is to provide a working knowledge and an exposure to cutting edge developments in operation and control of electric energy processing systems. The book focuses on the modeling and control of interdependent communications and electric energy systems, Micro-Electro-Mechanical Systems (MEMS), and the interdisciplinary education component of the EPNES initiative. James Momoh was chair of the Electrical Engineering Department at Howard University and director of the Center for Energy Systems and Control. In 1987, Momoh received a National Science Foundation (NSF) Presidential Young Investigator Award. He is a Fellow of the IEEE and a Distinguished Fellow of the Nigerian Society of Engineers (NSE). His current research activities for utility firms and government agencies span several areas in systems engineering, optimization, and energy systems' control of complex and dynamic networks. Lamine Mili is Professor of Electrical and Computer Engineering at Virginia Tech. An IEEE Senior Member, Dr. Mili is also a member of Institute of Mathematical Statistics and the American Statistical Association. His research interests include risk assessment and management of critical infrastructures; power system analysis and control; bifurcation theory and chaos; and robust statistics as applied to engineering problems. 1 A FRAMEWORK FOR INTERDISCIPLINARY RESEARCH AND EDUCATION (James Momoh). 1.2.1 The Power System Modeling and Computational Challenge. 1.2.2 Modeling and Computational Techniques. 1.2.3 New Interdisciplinary Curriculum for the Electric Power Network. 1.3.1 Modular Description of the EPNES Architecture. 1.3.2 Some Expectations of Studies Using EPNES Benchmark Test Beds. 1.4 Test Beds for EPNES. 1.4.1 Power System Model for the Navy. 1.4.2 Civil Test Bed—179-Bus WSCC Benchmark Power System. 1.5 Examples of Funded Research Work in Response to the EPNES Solicitation. 1.5.1 Funded Research by Topical Areas/Groups under the EPNES Award. 1.6 Future Directions of EPNES. 2 DYNAMICAL MODELS IN FAULT-TOLERANT OPERATION AND CONTROL OF ENERGY PROCESSING SYSTEMS (Christoforos N. Hadjicostis, Hugo Rodríguez Cortés, Aleksandar M. Stankovic). 2.2.1 Fault Detection via Analytic Redundancy. 2.3 Detuning Detection and Accommodation on IFOC-Driven Induction Motors. 2.3.1 Detuned Operation of Current-Fed Indirect Field-Oriented Controlled Induction Motors. 2.3.2 Detection of the Detuned Operation. 2.3.3 Estimation of the Magnetizing Flux. 2.3.4 Accommodation of the Detuning Operation. 2.4 Broken Rotor Bar Detection on IFOC-Driven Induction Motors. 2.4.1 Squirrel Cage Induction Motor Model with Broken Rotor Bars. 2.4.2 Broken Rotor Bar Detection. 2.5 Fault Detection on Power Systems. 2.5.3 The Navy Electric Ship Example. 3 INTELLIGENT POWER ROUTERS: DISTRIBUTED COORDINATION FOR ELECTRIC ENERGY PROCESSING NETWORKS (Agustın A. Irizarry-Rivera, Manuel Rodrıguez-Martınez, Bienvenido Velez, Miguel Velez-Reyes, Alberto R. Ramirez-Orquin, Efraın O’Neill-Carrillo, Jose R. Cedeno). 3.2 Overview of the Intelligent Power Router Concept. 3.3 IPR Architecture and Software Module. 3.4.1 State of the Art. 3.4.2 Restoration of Electrical Energy Networks with IPRs. 3.4.5 Islanding-Zone Approach via IPR. 3.4.6 Negotiation in Two Phases. 3.5 Risk Assessment of a System Operating with IPR. 3.6.1 Distributed Control of Electronic Power Distribution Systems. 3.6.2 Integrated Power System in Ship Architecture. 3.6.3 DC Zonal Electric Distribution System. 3.6.4 Implementation of the Reconfiguration Logic. 3.8 Economics Issues of the Intelligent Power Router Service. 3.8.1 The Standard Market Design (SMD) Environment. 3.8.2 The Ancillary Service (A/S) Context. 3.8.3 Reliability Aspects of Ancillary Services. 3.8.4 The IPR Technical/Social/Economical Potential for Optimality. 3.8.5 Proposed Definition for the Intelligent Power Router Ancillary Service. 4 POWER CIRCUIT BREAKER USING MICROMECHANICAL SWITCHES (George G. Karady, Gerald T. Heydt, Esma Gel, Norma Hubele). 4.2.1 Medium Voltage Circuit Breaker. 4.3 The Concept of a MEMS-Based Circuit Breaker. 4.4 Investigation of Switching Array Operation. 4.4.2 Analysis of Current Interruption and Load Energization. 4.4.3 Effect of Delayed Opening of Switches. 4.4.4 A Block of Switch Fails to Open. 4.4.5 Effect of Delayed Closing of Switches. 4.4.6 One Set of Switches Fails to Close. 4.4.7 Summary of Simulation Results. 4.5.1 Approximations to Estimate Reliability. 4.6 Proof of Principle Experiment. 5 GIS-BASED SIMULATION STUDIES FOR POWER SYSTEMS EDUCATION (Ralph D. Badinelli, Virgilio Centeno, Boonyarit Intiyot). 5.1.2 Generic Decision Model Structure. 5.2 Concepts for Modeling Power System Management and Control. 5.2.1 Large-Scale Optimization and Hierarchical Planning. 5.2.2 Sequential Decision Processes and Adaptation. 5.2.3 Stochastic Decisions and Risk Modeling. 5.2.4 Group Decision Making and Markets. 5.2.5 Power System Simulation Objects. 5.3 Grid Operation Models and Methods. 6 DISTRIBUTED GENERATION AND MOMENTUM CHANGE IN THE AMERICAN ELECTRIC UTILITY SYSTEM: A SOCIAL-SCIENCE SYSTEMS APPROACH (Richard F. Hirsh, Benjamin K. Sovacool, Ralph D. Badinelli). 6.2.1 Using the Systems Approach to Understand Change in the Utility System. 6.2.2 Origins and Growth of Momentum in the Electric Utility System. 6.2.3 Politics and System Momentum Change. 6.3.1 The Possibility of Distributed Generation and New Momentum. 6.3.2 Impediments to Decentralized Electricity Generation. 6.4 Practical Consequences: Distributed Generation as a Business Enterprise. 6.5 Aggregated Dispatch as a Means to Stimulate Economic Momentum with DG.